The country’s biggest integrated expo dedicated to empower innovative entrepreneurs and growing franchise businesses The Entrepreneur and Franchise Expo (EFE) “Your Step to Success”, as well as the Entrepreneur Success Summit (ESS) 2014 were officially launched on May 20, 2014 at the Privato Hotel in Pasig City. The ENTREPRENEUR SUCCESS SUMMIT 2014 (ESS) - #Step2Success is a series of comprehensive talks in the fields of Start Up, Food, Fashion, Money Management and New Media Marketing by 20 successful international and local entrepreneurs and industry experts who will share their insights on how to build a successful business. “Our vision is to provide business owners and aspiring entrepreneurs an environment with activities and programs where they can network with other business stakeholders, introduce their businesses, learn the latest industry trends and to assist them in growing their business to achieve their step to success” says MEDIACOM SOLUTIONS INC. president and expo founder, David Abrenilla. The press conference was hosted by Vince Golangco. Local and international entrepreneurs and business executives from various industry sectors participated in the event gave a short introduction of what to expect when visiting the expo and what attendees will learn at the summit. Among the invited guests were RUDOLF KOTIK, founder of Filipino International Franchise Association (FIFA); RANDELL TIONGSON, director of the Registered Financial Planners Institute Philippines; JANETTE TORAL, founder of DigitalFilipio.com, KIAN KAZEMI, president of Persia Grill; JORGE AZURIN, regional director of Freelance.com; MITCH MALLI, co-founder of Draft Gastropub, Imperial Ice Bar & Beso Cusina Vinoteka; CHRISTOPHER TAN, founder of Flippish.com; KAREN BORDADOR, president of SisterSecrets.com.ph; Navin Uttamchandani, president and COO of Esquire Financing; together with guest of honor Mandaluyong City Councilor and Vice Chair for MSME Development Council, the honorable CHARISSE ABALOS. The 3-day exhibition will feature the latest products and services of 100 innovative businesses from various industry sectors, like food, technology, tourism, business solutions, fashion, retail, entertainment and many more with over 10,000 expected visitors and business professionals. Across the three days, visitors will have the opportunity to connect with inspiring local and international business leaders, find great investment opportunities, indulge in delicious food tastings, avail of exclusive discounts and promotions, win great raffle prizes, as well as learn the latest trends in business and entrepreneurship through various activities. The Entrepreneur and Franchise Expo (EFE) and the Entrepreneur Success Summit (ESS) is organized by the MEDIACOM SOLUTIONS INC., a leading business community building and exhibition and convention organizing company that is dedicated to uplift the Philippine economy in the fields of entrepreneurship, SME development, franchising, property investment, fitness & wellness and baby & family care. The EFE and ESS is supported by the Filipino International Franchise Association and the Young Entrepreneurs Society Philippines. 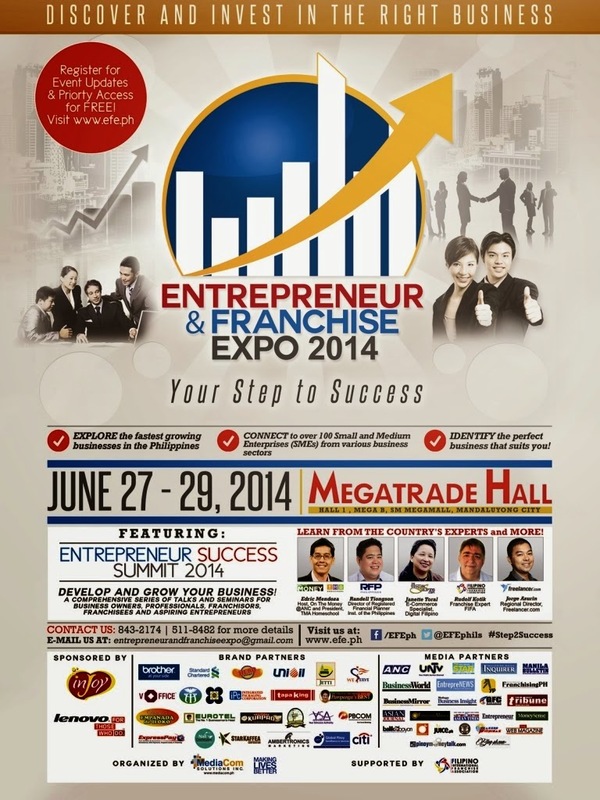 The EFE will be held from June 27-29, 2014 at Megatrade Hall while the ESS will be held on June 28, 2014 at the Megatrade Function Rooms of the SM Megamall, Mandaluyong City. Get your VIP SUCCESS PRIORITY ACCESS for the expo and avail of the 30% early bird discount to access the summit at www.efe.ph. For updates, join the community at www.facebook.com/efeph or follow in Twitter and Instagram @EFEphils. For inquiries, call +632.509.4792 or email entrepreneurandfranchiseexpo@gmail.com. Such nice post about The Entrepreneur and Franchise Expo. I am so pleased that everyone had just great time over there. At some local LA venues we also would be hosting a business event and have been finding a talented planner for organizing this event. Could you provide any recommendations?